"El Dorado" is the second track from English heavy metal band Iron Maiden's 2010 album The Final Frontier. The song is the band's forty-first single, and the only one from the album. It was made available as a free download on the band's official site at 00:01 on 8 June 2010 (UTC), one day before the album's supporting tour began. The cover art was created by Anthony Dry and is based on the covers of the EC Comics published by William Gaines that were popular in the 1950s. Regarding the early online release of the song, vocalist Bruce Dickinson explained, "El Dorado is a preview of the forthcoming studio album. As we will be including it in the set of our Final Frontier World Tour, we thought it would be great to thank all our fans and get them into The Final Frontier mood by giving them this song up front of the tour and album release." "El Dorado" won the Grammy Award for Best Metal Performance in 2011. It is the band's first win following two previous nominations ("Fear of the Dark" in 1994 and "The Wicker Man" in 2001). The song's guitar solo, which lasts from about 3:42 to 4:23, is a trade-off divided into three parts; the first is played by Adrian Smith (3:42-3:53), the second by Dave Murray (3:53-4:06), and the third, which segues into the verse riff again, by Janick Gers (4:06-4:23). ^ a b "'We're Taking No Prisoners'". Kerrang!. 9 June 2010. Retrieved 9 June 2010. ^ a b "Maiden Announce Release Date, Artwork and Tracklisting for New Album The Final Frontier". Iron Maiden official website. 8 June 2010. Retrieved 11 July 2010. ^ "Iron Maiden, Slayer, Megadeth, Ozzy, Korn Among Grammy Awards Nominees". Blabbermouth. 1 December 2010. Archived from the original on 6 December 2010. Retrieved 2 December 2010. ^ "Grammy Awards: Best Metal Performance". Rock on the Net. Retrieved 8 March 2009. ^ "53rd Grammy Awards Winners". Grammys. 13 February 2011. Archived from the original on 1 December 2011. Retrieved 13 February 2011. 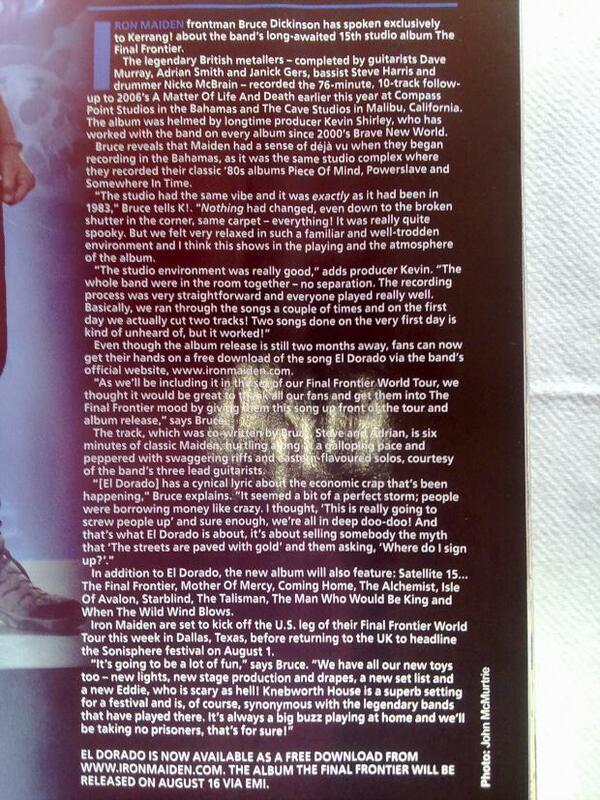 ^ "El Dorado - Single Review". Ultimate Guitar. 10 November 2010. Archived from the original on 28 July 2012. Retrieved 31 August 2011.